I’m afraid blogging has taken a temporary back seat while I’m prioritizing my final weeks working in the laboratory. I plan to start writing more consistently, and to work on plans regarding the future of RealTimeChem, in December. For now I’d like to remind you that this month is Movember. A time when large numbers of manly men all over the UK and across the globe sprout facial hair with the aim of raising awareness of men’s health issues. In particular, the dual threat of prostate and testicular cancer. It turns out that growing my facial hair is pretty much my one true superpower (why couldn’t it be telepathy?! ), so I decided to take on the challenge this year and grow an impressive moustache. Anyone who follows me on twitter will already have seen the results so far and no doubt had a good chuckle! I’ve been going for the 1980’s Tom Selleck as Magnum, P.I. look. 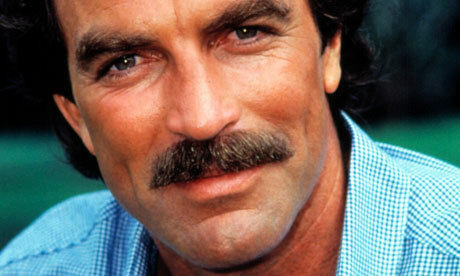 The Magnum PI moustache of glory. Revel in it people. Revel. As you can see below, I think I’m doing quite well. I’ll just have to start solving crimes, driving fast cars and wearing loud Hawaiian shirts to complete the look. For Movember, I’m part of the team “I moustache you not to laugh at me” and we’re still hoping to raise £1000 if we can! So if you enjoy reading Doctor Galactic and The Lab Coat Cowboy, please give a few pounds or pennies to a good cause. You can find my page and the all important donate button at the link: here.